The 2018 DCSD All-Star soccer games are set for Thursday, May 17 at Adams Stadium beginning with the girls’ at 6:00 pm and followed by the boys at 8:00 pm. Lakeside’s Tim Newmyer and Tucker’s Terilyn Lake lead the Girls’ Scarlet Red team against the Turquoise Blue squad led by Druid Hills’ Katy Cochran and Brandon Bennett, Towers’ Stephen Kane and Miller Grove’s Tricia Sang in the opening game. Scarlet Red has several of the top scorers in the county this season led by Southwest DeKalb senior Georgia Anna Sinclair and her county leading 41 goals. She is also tied for second in DeKalb with 11 assists on the season. 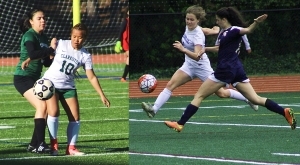 Martin Luther King Jr. senior Jasmine Mathis (30 goals), Clarkston senior Palma Tamang (23 goals), Columbia junior Brandy Jackson (23 goals), Lakeside junior Olivia Cohen (21) and Tucker junior Anna Lippy (21) all have over 20 goals on the season. Lakeside senior goalie Julia Moreman (7-3-2) is set to play in goal for the Scarlet Red team. Moreman leads the county with a 0.52 goals allowed average in 612 minutes defending the goal. Turquoise Blue has the county’s second leading scorer in Redan sophomore Amadia Veasley who had 34 goals and is tied for second with 11 assists. Towers junior Shaheedah Watkins has played 888 minutes in goal this season with a 5.23 goals allowed average and is 8-6-0 in goal on the season. Druid Hills’ Thomas Bodnar, Stone Mountain’s Doug Dakin and Clarkston’s Andrew Goodman lead Boys’ Team White against Team Black led by Cross Keys’ Derrick Burgess, Tucker’s Cameron Heyen and Stephenson’s Michael Gaskin in the boys’ all-star game set for 8:00 pm at Adams Stadium. Team White has five of DeKalb’s scorers with 10 or more goals led by Stone Mountain’s Alex Kalombe who is seventh with 15 goals on the season. Clarkston’s Gezai Eta and Druid Hills junior Nate Jackson are right behind Kalombe with 14 goals each and Southwest DeKalb senior Marquel Crowder with 13. 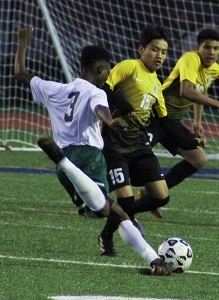 Arabia Mountain sophomore Ahdjogo Mahnassi finished with 10 goals on the season. The goal should be in good hands with Stone Mountain senior Arley Marrowquin (6-4-2, 1.35 goals allowed, 886 minutes). Team Black boasts the county’s top three scorers this season in Cross Keys junior Eduardo Dimas (25 goals, 17 assists), Tucker Senior Aoci Pilipili (24 goals, 11 assists) and Cross Keys freshman Anthony Maldonado (22 goals, 20 assists). They are joined by other Top 20 scorers sophomore Hakeem Linton (18, 11) of Towers, Lithonia senior Julian Tinoco (11 goals) and Lithonia sophomore Levacatus Niyukuri (10 goals). In goal for Team Black are Lakeside junior Andrew Seabolt (5-2-2, 0.98 goals allowed, 650 minutes) and Stephenson senior Austin Brown (9-5-0, 2.19 goals allowed, 1,060 minutes).